The standard message, which is entered in Agency Information, appears automatically when the Information Center window is opened. But if you create daily messages, they will be shown instead. In addition, a special message can be entered that appears whenever staff members use their time cards. These messages can remind users of staff meetings, vacation days, client presentations, or other events. Everyone sees the same daily messages each time their Information Center window opens. Up to a year’s worth of daily messages can be scheduled. 1 Choose Setup > Utilities > Daily Messages. 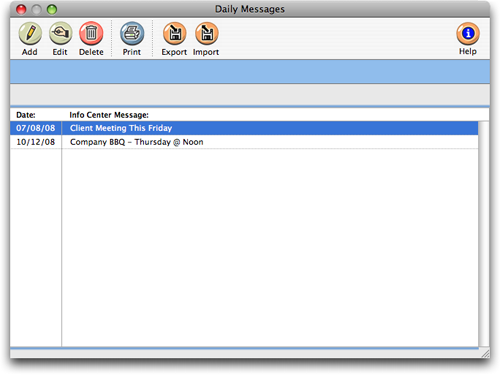 The Daily Messages window opens, displaying all of your info center messages. Animated messages get attention. The daily message scrolls, flashes, moves to grab the user’s attention whenever the Information Center is opened. Use these messages to keep staffers informed about meetings, news, events, etc. 2 To add a new Daily Message, click the Add button. The new information center message will appear immediately the next time a user opens their Information Center window. The Daily Messages window opens, listing the year’s upcoming scheduled messages. 1 From the Daily Messages window, double-click on a message. 1 From the Daily Messages window, click the add button or choose Edit > Add Message. The Add Message window opens (see right), prompting you to enter the message’s date (i.e., the day on which it’ll run), an Information Center message and an optional time card message. 2 Enter a run date, Information Center message, and time card message. The message’s date is important, since it determines when the message will appear to users. 1 Choose Edit > Create Messages. Clients & Profits X will create a year’s worth of daily message records starting with today’s date. The message text is empty, so will need to be entered before the message can run. The purge command erases all of the daily message records. To purge the daily messages, choose Edit > Purge Messages.